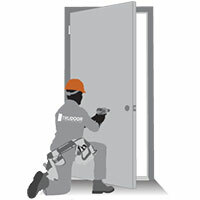 Installation instructions are provided with most hardware products, but not frames and doors, as commercial door manufacturers do not provide print instructions with their products. We recommend hiring a licensed contractor or experienced handyman to install the doors we supply, as certain applications may prove to be too complex for a novice. Furthermore, all products provided by Trudoor are intended for commercial construction. While we do not offer installation or field repair services, our support team has put together a collection of guides to help assist you with proper installation of the products that we provide. Click on one of the following links to view or download PDF instructional guides. More guides and videos will be added, as they become available. Guides on this page were provided by manufacturers, industry associations and/or Trudoor. The procedures described in the instruction sheets and manuals on this page, are only guidelines. Please follow applicable building codes, standards and accepted practices specific to your geographic location.